When midnight strikes on June 30, a highly successful 45-year-old will die, survived by a precocious toddler and a promising teenager. The deceased will leave a legacy that affects every corner of American health care — and the youngsters are itching to do the same. All three are training programs, not people. 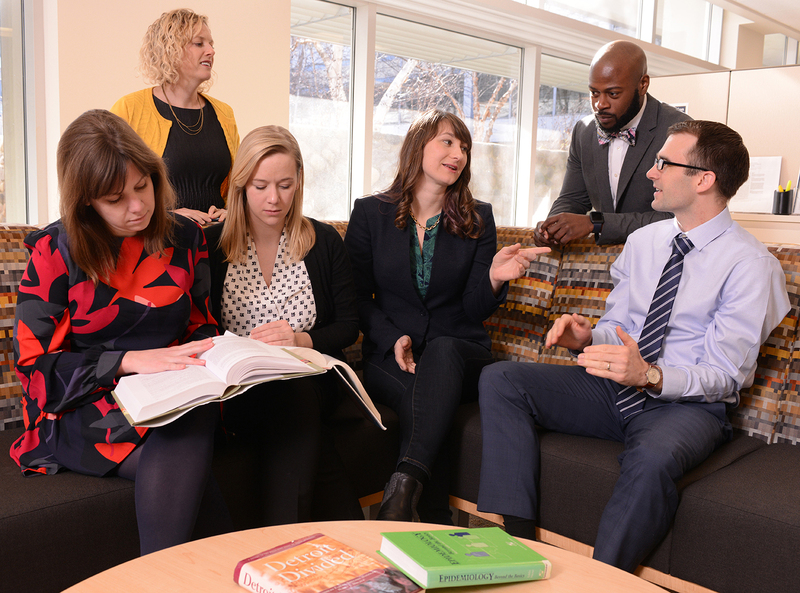 They share the same goal: to prepare early-career clinicians to transform health care and health policy through high-quality research. That goal has even more urgency now than it did when the 45-year-old was born. Health care research is on center stage in today’s age of Big Data, increasing out-of-pocket and societal health care costs, and major change in how the nation delivers, pays for and improves care. “As our nation faces the reality that we can’t keep spending more and more of our gross domestic product on health care, we need scholars at that table, thoughtful people to make sure we don’t cut out a lot of flesh as we’re trying to get rid of flab,” says Rodney Hayward, M.D., a professor of internal medicine and Veterans Affairs researcher. Each year, a hand-picked group of young clinicians comes to U-M to learn how to design and carry out data-driven studies that can help America wring the most value out of health care dollars, make health policy changes based on solid evidence, and identify and close gaps in safety, equality and access to care. Hayward is a product of the 45-year-old program, called the Robert Wood Johnson Foundation Clinical Scholars Program (RWJF). So are 40 other U-M faculty members. Michigan has been a training site for the RWJF program for 22 years, and has trained 126 clinicians in statistical methods, study design principles, policy concepts, economics, leadership and more. They all receive the time and mentoring they need to carry out a two-year-long research effort — and produce evidence that can be put to immediate use. Their projects run the gamut of health care, from heart attack care optimization to disaster response planning to health disparities in adolescents. “To my mind, this has been the single most efficient research training program for producing health care scholars that there has ever been, producing outstanding academics but also scholars who go directly into public and private sector service,” Hayward says. Thirteen years ago, U-M added a new program: a way for other young clinicians to study alongside the RWJF clinical scholars, and earn the same master’s degree in health and health care research. That program, which many clinical departments have used to help recruit promising young faculty, has graduated 161 students. But in 2015, the unthinkable happened. The Robert Wood Johnson Foundation announced it was heading in a new direction and would sunset the Clinical Scholars Program’s funding. The scholars accepted that year, who finish their training this month, would be the program’s last. Hayward and his colleagues at U-M and the other three institutions knew the concept was too good to let die. That led to the birth of the precocious “toddler,” which goes by the name of the National Clinician Scholars Program (NCSP). The child goes one step beyond the parent, opening training up to doctoral-level nurses (and in U-M’s case, pharmacists) as well as physicians. In addition to the multidisciplinary focus, it also allows scholars to choose a global, rather than U.S.-centric, focus for their health care research. The first crop of clinician scholars just finished its first year, and the next group will start in July. Dozens of applicants vied for each spot, and more are expected to apply in the new round, which opened this month. For now, the University of Michigan and its three NCSP peers have stepped forward with funding to support the programs. Their local Veterans Affairs research centers support some positions, for a total of five to seven Clinician Scholars at each school. IHPI administers the new program at U-M, giving the scholars and masters’ students access to the 500 U-M faculty from 17 schools and colleges who belong to the institute. Just as with the RWJF program, this means that all the scholars receive their training for free, and are paid a stipend to boot — freeing them to pursue the research they feel can have the most impact. To learn more about the NCSP, visit their website or apply here. The application deadline is Aug. 1, 2017, at 5 p.m. EDT.